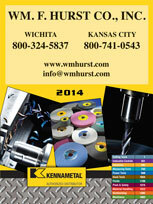 When you want exceptional carbide tools for your industrial operation in the Midwest, the best place to turn is Wm. F. Hurst Co. LLC. We offer quality carbide products from several well-known cutting tool manufacturers, and we go a step further by also providing unrivaled customer support services to our customers in Kansas City, Wichita, Dallas, Fort Worth, and other surrounding cities. We’re confident you can find the carbide tools you need for your operation among our unmatched selection, which features carbide insert options, carbide drills, and solid carbide end mills. Our staff has in-depth knowledge of all of the products we offer as well as experience with a wide range of industries, so you can count on us to recommend the carbide products that would help you reduce costs and improve processes. If you would like to receive more information on the carbide tools we have available, contact Wm. F. Hurst Co. today. We also offer many other industrial supplies, including Sugino air feed drilling equipment, Radiac and 3M abrasives, Dotco and Cleco air tools, and CimCool metalworking fluids. We proudly serve businesses in cities throughout the Midwest, including Kansas City, Wichita, Dallas, Fort Worth, Joplin, Springfield, and Sedalia.